Enough solar power hits the Earth every hour to power every nation for a year. It’s time you get in on this free power. 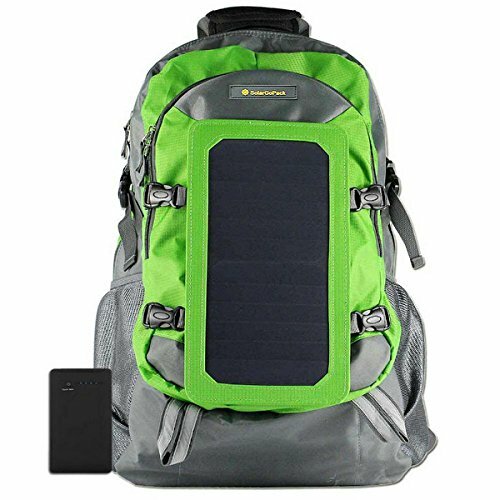 This article is to help you pick the best solar backpack. The best one for you. Do it for you, do it for the Earth- just do it! 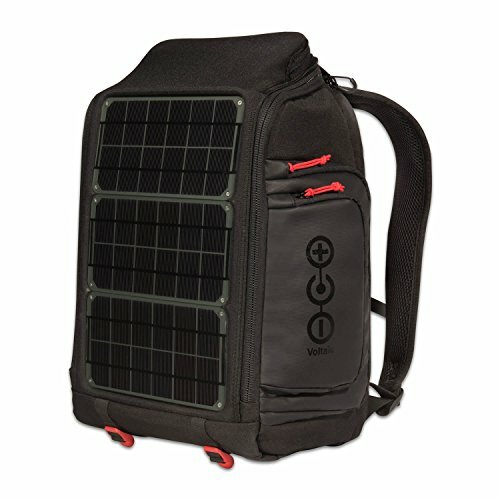 Our Top Pick: Voltaic Systems Array Rapid Solar Backpack. It is the metric by which all other packs should be judged. Our only reservation is the price. It is worth every penny, however, not everyone’s budget is the same. Just know that if the price is no object this is the solar backpack for you. Stop reading and go buy this pack. It can carry what you need. Whatever you can carry, it can charge. It is even environmentally responsible in its construction. The question is why not! It can fill so many roles. Once you have a solar backpack you will wonder why you waited. How did you get along with this glorious device? If you are constantly on the go, solar backpacks are for you. Never again be stuck searching for a wall outlet. As you travel your devices can charge. Stuck in an airport and can’t find a plug? Step outside. Even walking over and placing the solar unit by the window will get you going. Never again be “that guy” (or gal). Hiking, biking, skiing, you name it, the great outdoors is fun! What isn’t fun, worrying if your phone is run dry. Did searching for a signal just empty your freshly topped off battery? That is not what you should be thinking when you are in the great outdoors. We would all like to be able to unplug. But lots of times it is not safe or reasonable to be completely cut off Having a solar backpack means you don’t need to worry. You aren’t planning an outing around power needs. If your job has you on the field, you have stuff. You have work gear, and you have the stuff you need. Between issued gear, the extras they don’t give you and the things that make your day easy…it is a lot. What better way to store all that random gear than a bag. Oh, wait, a bag that powers your devices. Yea you will be the guy everyone wants on their crew. Being able to be organized and always power up. It is a good way to go through life. Natural disasters, terrorist attacks, protests, and on and on. Things happen every day that can throw people’s life into turmoil. Having a little peace of mind is valuable. It’s bad enough being forced from your home. Or being kept from getting to your house. Why add a dead cell phone to an already chaotic situation? Having a mobile, self-renewing power bank- that is huge. Look at it as some amazing insurance. I had never had a Voltaic backpack. Never tried one, never held one. I won’t travel without one now. It is that damn good! Made from 33 recycled water bottles. Go Earth! That’s it. If the price is your primary concern read on. There are plenty of quality packs at lower prices. But if you need the best, the price is no object- get this now! Buy two, you will use these bags for everything! I would hate to say that I am a Voltaic fanboy now, but I am. No one else is doing what they do better. For what they offer they dominate the other offerings. HOWO is sport meets practicality. You get a great price that will fit a lot of budgets. You get quality charging capability. This solar backpack is fairly light but still sturdy. You also get the added perk of an integrated hydration bladder. This is a great pack for grab and go. It won’t be your multiday duffel bag. That is ok, but it is important to note what role this bag should play. 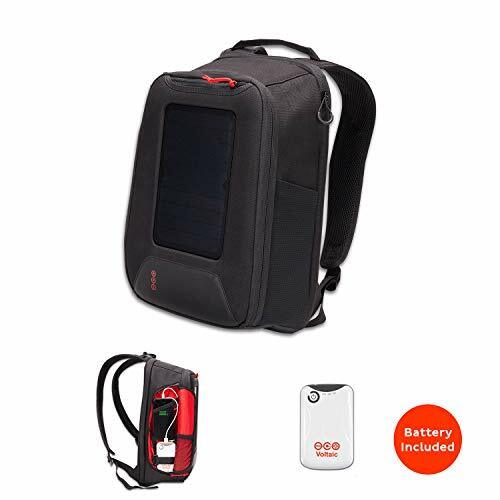 The price point is great for someone looking for a quality, smallish solar backpack. It is lightweight but reasonably sturdy which is great. The electric transfer rate is great for this price level as well. The main reservations about this backpack revolve around personal preference. I am not ever thrilled about combing water with a battery pack and my computer. Some people don’t worry about that, I do. The other issue is color. It may seem small but this is not something that I would take into a serious office. It is bright, it stands out. Great for a trail so you never lose it. Not so great if everyone is in suit and tie. ECEEN makes quality gear. This is their hiking solar backpack. This would be similar in size and weight to a smaller sling backpack. This thing is focused from the top down. That focus is high speed, low drag. If you are keeping weight down (think hiking, biking, etc) this could be for you. 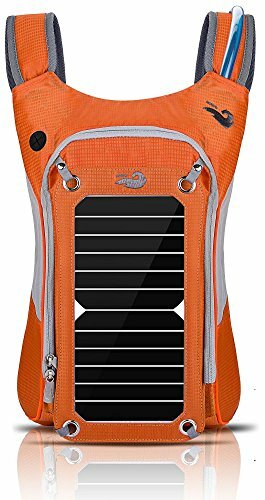 This is a great trail solar backpack. If you need low weight then this is a great option. Not as much. But then again it isn’t aimed at that role. For what this bag is intended to do it is a solid contender. Ivation makes a nice, sturdy yet light solar backpack. The addition of a water bladder is a pro or con depending on how much you trust it to not leak. If you have thousands of dollar of electronics in this bag, you might not want an integrated bladder. If you NEED rapid charging, you might look elsewhere. If this is more of a casual use, just to make sure there’s some juice- this would fit. The construction is solid and works great as a weekend warrior bag. Voltaic is on the list again! This is the little brother to the Voltaic Array. This is another rock-solid bag. This solar backpack is just as high quality as the array but in a budget-friendly package. If the price tag was the only thing keeping you from getting the Voltaic Array, get this bag. You get most of the important aspects of the higher price bag at an affordable price. This is great for casual use, work assignments and outdoors. For the diehard outdoorsman, this pack is good to go! It does have a rugged look to it but wouldn’t be completely out of place in most offices, especially if not prominently displayed. If I were going on a long range hike, and often this would be bad I would strongly consider. The higher end of the market, but for what you get a great price! This is a great backpack at a great price. It is heavy duty and looks great. It is high quality all the way around. Unless everyone you work with wear a full suit and tie every day this will fit in fine at work too. This backpack was about even with the other SolarGoPack. The reason this one is a little behind in ranking is it is a little less robust and because it comes in only bright, garish colors. 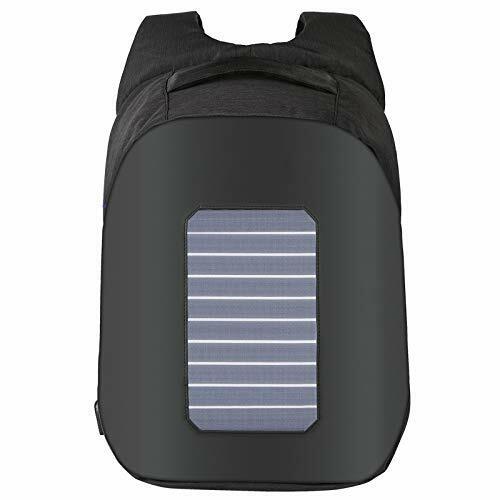 This is by no means a bad solar backpack, we just needed to note fairly its differences. This is a nice solar backpack. It will do everything you need it to. It isn’t the best or the worst. 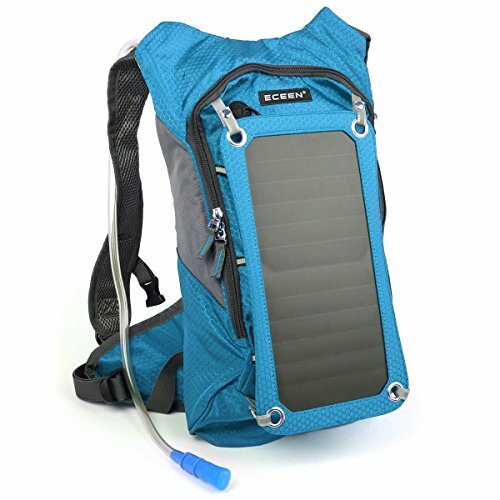 I can say it is just a good solar pack without a lot of frills. Its appearance does lead itself better to emergency or strictly outdoors/rec use. FARAZ makes a great office focused solar backpack. Can you use it for other things? Of course! It is just aimed at a certain demographic, but no less capable than similar competition. It is certainly a stylish backpack. This is an office workers backpack. It can be used for other things but this is where it shines. It would not be out of place in your conference room or about town. While not a waterproof solar backpack, it is highly water resistant which is great to get you from the car to the office or across town in a light rain. 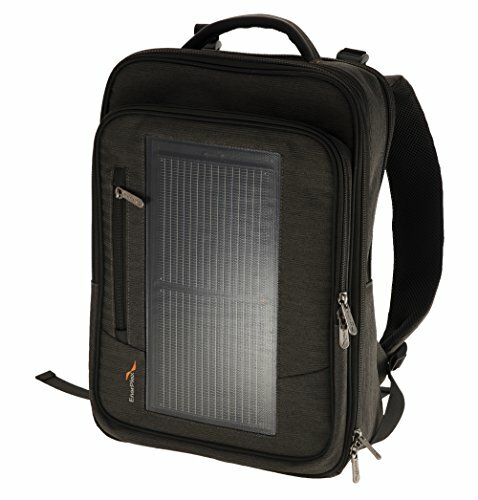 The solar-powered college backpack. This is for the college students. It would also make a stylish work bag without any issues. The solar panel is more integrated into this bag than some others. Clean and stylish looks are this bags strong suites. If you are headed off to school, this is a great option. You can charge on the go, it looks great and it will hold some books. I really like the option to charge externally so you don’t always have to open your bag up. 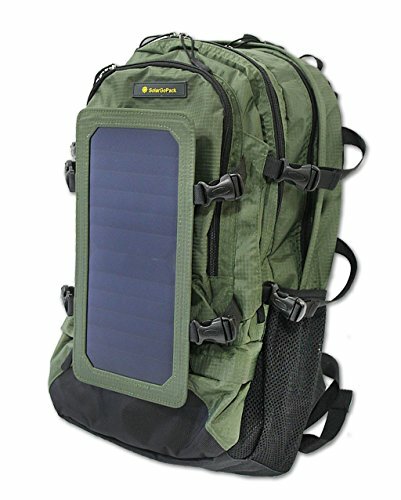 This is a solar backpack. That is its strong suit. It is technically a solar-powered backpack. It is not great at anything. I cannot say it pretty. It is actually fairly terrible looking and is of cheap quality. That said it is the cheapest on the list. If the price is your concern alone, this is your bag. 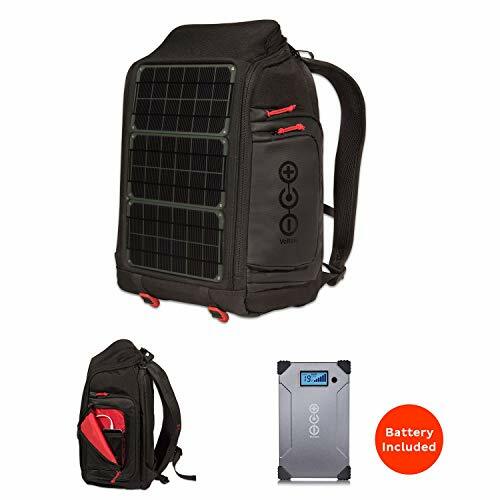 If you are on a super tight budget and need a solar-powered backpack, this is the cheapest option. It will not charge as well as any other bag on this list. It is the low-cost option that just gets you into some kind of solar backpack. Take the time to figure out what your solar powered backpack is for. What will you be charging? Will it be from a dead charge or maintaining as you travel? What sort of efficiencies, power outputs and ports do your devices need? No one will know better than you the devices you will be using with your new backpack. Total amperage of all ports combined. That is the power rating you need to look for. This will be the comparison metric for the power you will need to help pick your solar backpack. This rating affects how long it will take to charge your devices and how many devices can charge at once. It can even determine if the backpack can even charge your device at all. You will want a backpack rated for 1 amp for a phone and 2.1 amps for a tablet. This is your baseline. Your backpack will normally come with a USB port. Great for most on the go devices. Just keep this in mind when planning your needs as some things may not be USB compatible. Think ahead. Your bag will probably have 5V USB ports for you to charge with. What you want to keep an eye out for is a voltage stabilizer. The power the sun provides can be very unstable. Stabilizers help keep power output smooth and predictable. 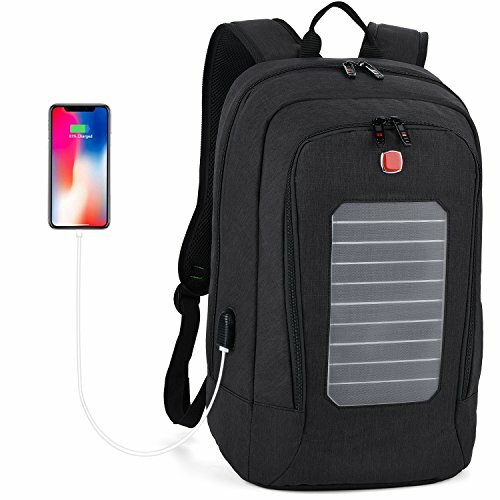 Whether you are directly connecting your device to the solar panel or using a battery as a middleman, you will still want to purchase a backpack with a built-in stabilizer. When you are studying the specs, keep in mind where you plan on taking the backpack, is it in the bright sunny desert? Or are you headed to a cold mountain, with the minimal sun? These devices may not generate as much energy as you need for large devices, so at the end of the day, consider your budget, but also your devices and the location of your next trip. For more options, see our reviews of the best solar chargers to power-up your gadgets. The first time out with your new backpack remembers it will be heavier. You have the solar charging apparatus, you have extra devices you might not normally bring. Do not let the extra weight overwhelm you. When you decide on a backpack make sure it is comfortable and supportive. Can your bag support the extra weight of your devices? How is the load spread over your body? Make sure your straps are well padded and have plenty of surface area. Avoid any pinch points. Does it have should straps that you can let out, or pull in depending on weight? Does the backpack feature hip straps that take any additional weight off your shoulders and lower back? Pick a backpack that will best accommodate the load you plan on hauling, and has the most customizable options. Don’t forget, you will want material that wicks moisture. Just like your devices your body doesn’t react well to sweat pooling on your body. To avoid general nastiness and being uncomfortable find a backpack that gets moisture away from your body. The point of a solar backpack is to create an easy way to charge your devices. While out on the trail, it would defeat its own purpose if it was difficult for you to use. The last thing you will want to be doing is messing with controls. 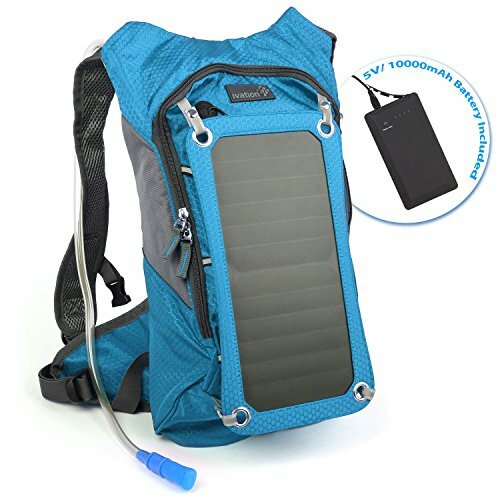 Charging ports and the functionality of the solar backpack are important. When you look through the gear reviews make sure that it is both user-friendly and effective. Ideally, the solar panel on the backpack should be self-operating. This should be a hands-off affair. The Voltaic Systems Array Rapid Solar Backpack is hands down the best solar backpack you can buy. It will do everything you need and keep coming back for more. Make sure your backpack fits YOUR needs. If it works for your budget and does what you need that is all you should worry about. Any backpack on our list will get you going, match your needs to one and have some fun!